What if I wrapped the coil in laminated iron? How can we do to improve efficiency? And hey, how about finally making it more portable? The biggest obstacle for practical coilguns is their apalling inefficiency. Hobbyists report typically 1% - 3% of their stored energy is converted into kinetic energy. This is horrible! Modern rotary motors are 80% efficient or better, due to a highly refined magnetic flux path. We should be looking at this area to improve coilguns. Until now, the only solution has been ever-larger, higher-voltage and more expensive power supplies. Some people have tried multiple stages but it requires many additional parts for detection and triggering. Instead of more stages, I will continue to study improvements to a single stage coilgun. My third model, the Mark III, wraps the coil in laminated iron. The iron lends its magnetism to the overall field, while the laminations help avoid eddy currents. 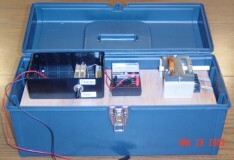 I am using a standard capacitive-discharge coilgun power system with an SCR. This has proven to be simple and reliable. Here is the schematic (very similar to the mark 2 schematic). I'm also considering a car battery instead of the big capacitor. As of 19 April 2003, this coilgun has achieved 5.86 m/s with one coil and 1.2 joules of energy stored in 24,000 uF capacitance charged to 10v. And then work was delayed after a connection got fried under a terminal barrier strip. This looked like an SCR problem, which took a long time to replace and then find the real problem..
Will notching the projectile reduce eddy currents and improve performance?